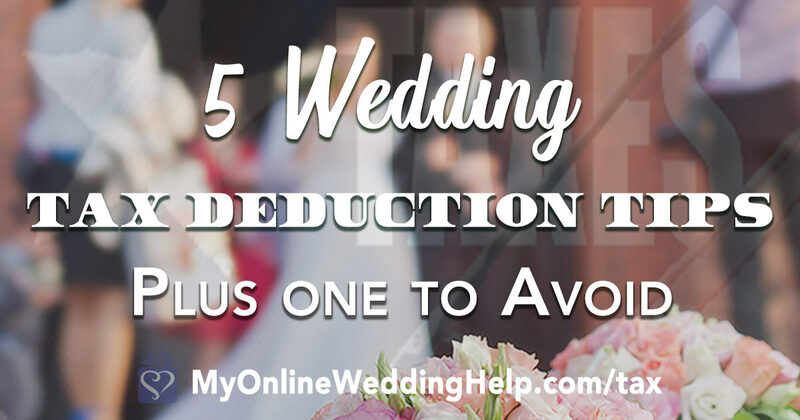 One way many people overlook when thinking of ways to save on their wedding is through tax deductions. Here are the rules along with corresponding IRS resources. I’ve followed these with some ideas for getting the deductions. If you use Schedule A to itemize deductions on a Federal 1040 tax return you can reduce your taxes. IRS Publication 526, found here, lays out the rules for what can and cannot count as a donation. First, if you received special extras in return for a contribution it is not tax deductible. Donating to a VFW in return for waiving the facilities fee for your reception, for example, is not tax deductible. If you give more than the usual cost of the facilities, though, the excess is deductible. Also, your donation has to be for general use, not designated for a particular person. What types of organizations can receive donations? “…organized and operated only for charitable, religious, scientific, literary, or educational purposes, or for the prevention of cruelty to children or animals” can qualify to receive tax-deductible donations. Private organizations have to be a qualifying non-profit for your donation to count against taxes. In other words, it has to be what’s known as a 501(3)(c). You can check if an organization is qualified to receive tax-deductible donations here. Fraternal lodges if they use your donation only for charitable, religious, scientific, literary, or educational purposes. Or for the prevention of cruelty to children or animals. Government-run facilities and organizations, as long as the donation is for public purposes only. The deduction varies depending on the type of donation. Property is valued at the fair market value in the condition at the time you donate. Your time or services (like the effort to complete a DIY project, for example) is not deductible. In any case, you will need receipts and photos for your records in case you are ever audited. If your donations are large compared to your income there may also be a limit to how much you can deduct. Your tax software or professional will can help you with that. Now that you know the rules, start by getting our complete wedding planning checklist. Make notes about the following tax deductions on your checklist. There are several organizations that specialize in finding wedding gown new homes. Check the wedding donations ideas pin board for some of them. Give leftovers to a food pantry or soup kitchen. Organizations that feed the hungry are always in need of good, nutritious food. Plan ahead to find one that can accommodate perishable food and desserts in bulk. Your leftovers can then feed those in need and you can deduct your cost. Drop off extra and usable decorations to Goodwill. Make sure to ask for a receipt. You also need to document the condition of each item because that determines how much you can deduct. Search for local branches at Goodwill.org. Give your flowers to a non-profit. There are several organizations that will take fresh flowers you no longer need. They then deliver them to people in need of a day-brightener. Search online or ask your florist if she knows of any in your area. Instead of spending money on favors or another element of your wedding, give the money to charity. Let guests know by placing charity cards on the tables. A popular idea going around is to have your reception at a museum or historical landmark. The advice states your facility fee is then deductible. That means the part of your donation representing the value of using the space is not deductible. If paying more than the usual cost you can deduct the excess. But if it’s only for the tax benefit, there are no net savings. 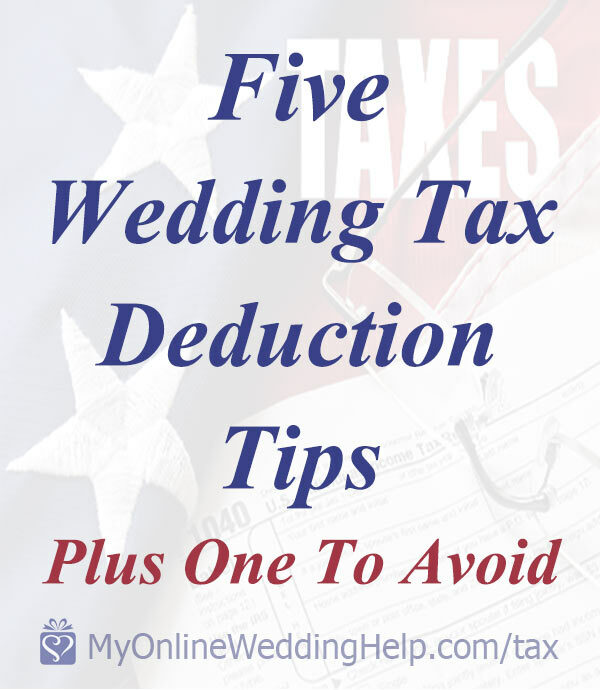 There you have it, five tips for using your wedding expenses to reduce taxes. Do you have any other ideas?